Holidays at the Disneyland Resort is here, and I’m excited to share with you all of the wonderful treats that are in store for the most magical season of the year! From now until January 7, 2018, you’ll be able to find everything on this guide at various locations throughout Disneyland Resort. 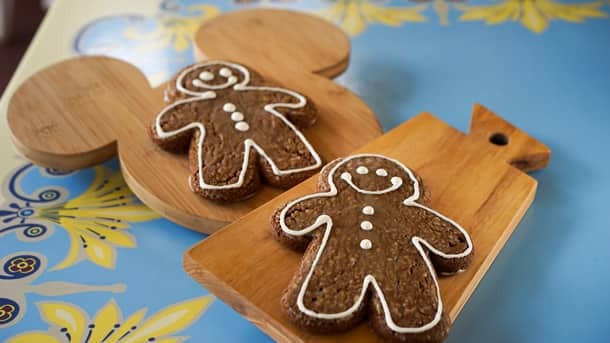 Run, run, run as fast as you can to try a tasty gingerbread man! You’ll be able to find these delightful gingerbread men at many locations throughout both parks and all three hotels. Disneyland park will offer gingerbread man cookies at Jolly Holiday Bakery Café, Market House, Red Rose Taverne, The Golden Horseshoe and Stage Door Café; Disney California Adventure park will have them at various carts throughout the park, Fiddler, Fifer & Practical Café, Pacific Wharf Café and Pacific Wharf Coffee Cart; at the Disneyland Resort Hotels, you’ll find them at The Coffee House, Hearthstone Lounge, and Surfside Lounge. Snowman shortbread cookies will also be available throughout the entire resort. At Disneyland park, you’ll find them at Jolly Holiday Bakery Café and Market House; while at Disney California Adventure park, you’ll find them at various carts and Fiddler, Fifer & Practical Café; and at the Disneyland Resort Hotels, you’ll find this cookie at Tangaroa Terrace and Surfside Lounge. 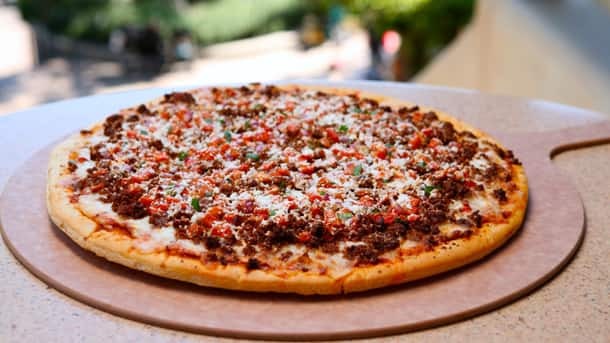 Other offerings that will be available across Disneyland and Disney California Adventure parks include holiday crispies, parfaits and brownies at various carts and locations throughout the resort. Peppermint mochas will be available at Jolly Holiday Bakery Café in Disneyland park; Pacific Wharf Coffee Cart in Disney California Adventure park; and The Coffee House, Hearthstone Lounge and Surfside Lounge at the Disneyland Resort Hotels. For the cotton candy fans out there, you’ll be excited to find yummy candy apple cotton candy at various carts in both parks. 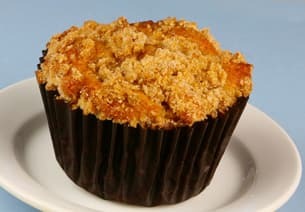 At Disneyland park, Jolly Holiday Bakery Café will be serving up caramel apple muffins with streusel as well as pumpkin spice lattes. The Main Street Coffee Cart will be offering various holiday doughnuts. At the French Market Restaurant, you’ll find praline cheesecake with graham cracker crust, a layer of praline crunch and almond brittle. 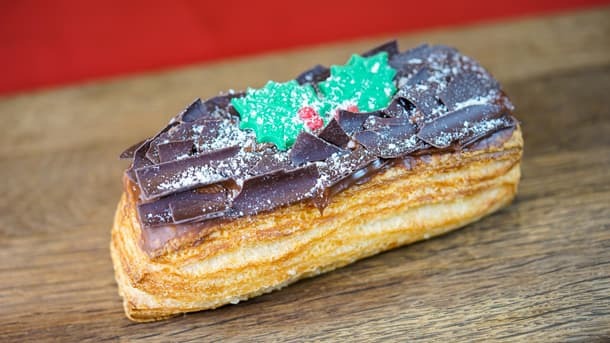 And for those wanting to get their chocolate fix, you can get a chocolate coffee Yule Log at Plaza Inn, with coffee buttercream filling, chocolate crunch and chocolate ganache. For the peppermint lovers out there, if you stop by Clarabelle’s Hand Scooped Ice Cream, Stage Door Café or Gibson Girl Ice Cream Parlor, you’ll find crushed candy cane topping, as well as peppermint ice cream at Gibson Girl Ice Cream Parlor. 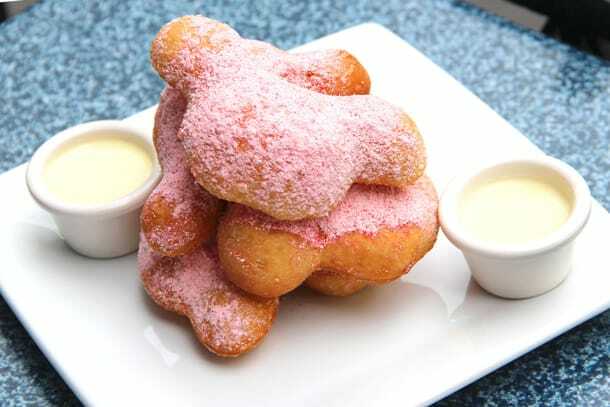 And Mint Julep Bar is celebrating the season with scrumptious candy cane beignets ­– yum! 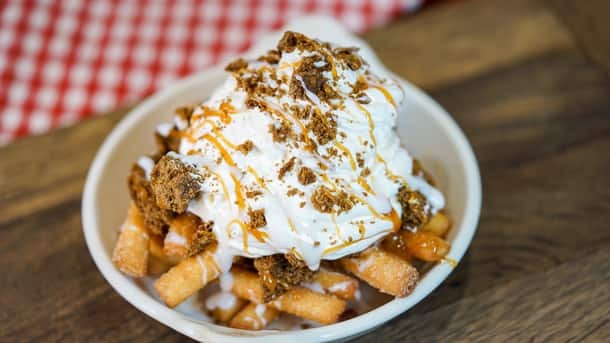 There are also several offerings continuing from the fall, like the graham cracker churro with marshmallow dipping sauce at the New Orleans Square Churro Cart and the Campfire S’mores Funnel Cake at Stage Door Café. 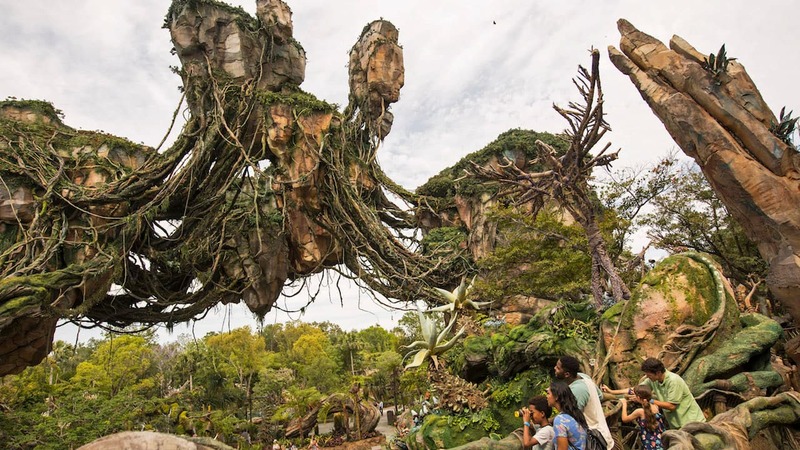 Savory options include the Enchanted Maize Flatbread at Red Rose Taverne with mozzarella, roasted corn, pickled red onions, parmesan, spicy lime aioli and chopped cilantro; or try the Bison Blue Cheeseburger at Hungry Bear Restaurant with candied bacon, sautéed mushrooms, baby kale and blue cheese tarragon sauce on a whole wheat ciabatta. At Disney California Adventure park, there will be many offerings in addition to the Festival of Holidays marketplaces. Clarabelle’s Hand Scooped Ice Cream will have a cinnamon roll apple strudel sundae, crushed candy cane topping for hand-dipped bars, and cinnamon spiced, dark chocolate Ghirardelli and white chocolate Ghirardelli hot cocoa. Mortimer’s Market and the Boudin Bread Cart will have candy cane-shaped bread and snowman-shaped bread. Award Wieners will be frying up gingerbread funnel cake fries. 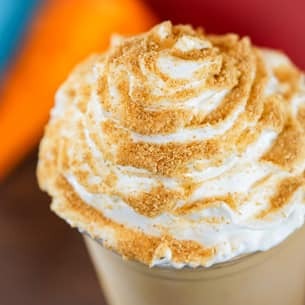 At Schmoozies, you’ll find a pumpkin pie smoothie, a blended peppermint Malibu mocha, a holiday doughnut and a Santa’s Mittens Macaron with mint chip ice cream; and Pacific Wharf Café will have pumpkin spice bread pudding. In Cars Land, Flo’s V8 Café is serving up chocolate peppermint pie and a peppermint candy cane shake, while the Cozy Cone Motel will have a red churro with crème anglaise and crushed candy cane topping. On the savory side, you can find Elote at various carts throughout the park – street-style corn with condiments including parmesan, mayonnaise and chile-lime seasoning. A turkey pot pie soup will be available at Pacific Wharf Café, and a meatloaf with bacon will be offered at Flo’s V8 Café. 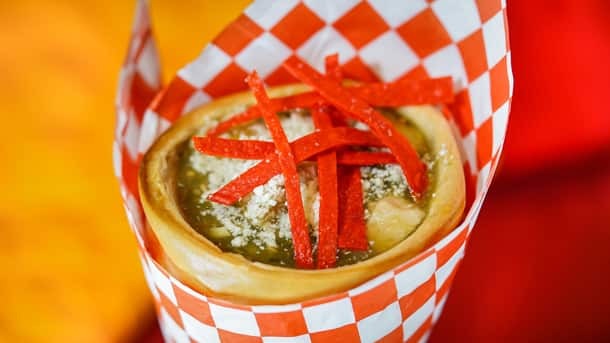 You’ll find the chicken verde cone at the Cozy Cone Motel, and at Boardwalk Pizza & Pasta, you can find a chorizo thick-crust pizza with creamy tomato sauce, mozzarella and cotija cheese, spicy chorizo, fresh pico de gallo and a tomatillo-cilantro crema drizzle. From Dec. 1 through Jan. 7, Carthay Circle Restaurant will have some special additions to their menu, including prime rib with cranberry horseradish, roasted leg of lamb with Christmas shrimp relleno, peppermint affogato, ginger monkey bread and a poinsettia cocktail consisting of Cointreau, cranberry juice and champagne and garnished with a twist of orange zest. You’ll also find this cocktail at Carthay Circle Lounge. The festive fun doesn’t stop at the parks! 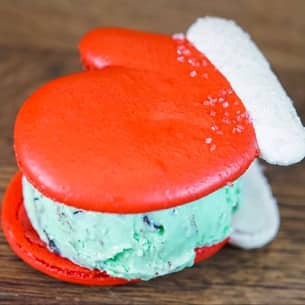 You’ll also be able to find some fun and delicious holiday offerings at the Disneyland Resort Hotels as well. The Coffee House at Disneyland Hotel and Surfside Lounge at Disney’s Paradise Pier Hotel will be offering eggnog, eggnog lattes and caramel apple muffins with streusel. 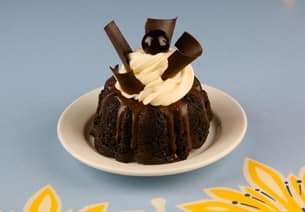 At Disney’s Grand Californian Hotel & Spa, you can find a Black Forest bundt cake at White Water Snacks and an eggnog latte at Hearthstone Lounge. And at the Gingerbread House Cart will be tree ornament cookies, pumpkin coffee loaf, traditional and peppermint hot chocolate, and hot cider with the option to add spiced rum. They used to have a caramel apple cider during the holidays in the park and it got moved around to a few different places every year, I thought I saw they would have it during halloween at the disneyland hotel but didn’t have a chance to make it over there. Any idea if it will still be there or if anywhere will have it? It was so good!! Thank goodness vacation calories don’t count. My word these all look delicious! 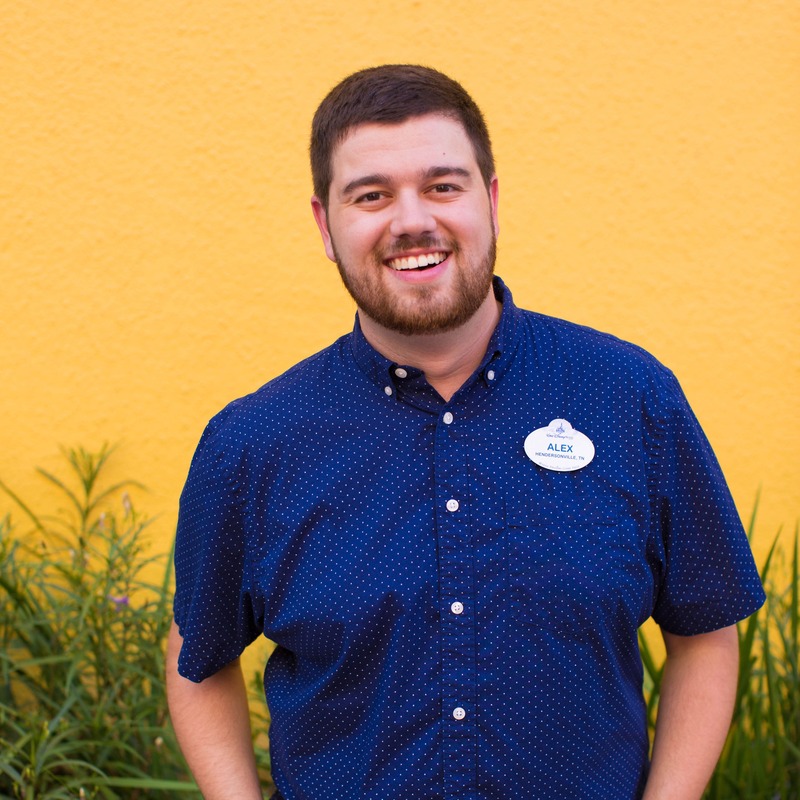 Thank you so much for all the updates at DLR! So many things to try on top of the Festival!